Brass marine Time & Tide clock. 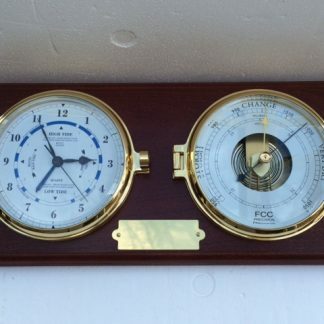 One of the smallest Time & Tide Clock available in this superior marine quality. Heavy cast brass case. Lacquered and varnished giving a highly polished appearance. Will not corrode in a marine environment. Fitted with rubber sealing ring stops moisture reaching mechanism. Slightly domed lens. Hinged door design allows simple access to alter times and fit battery. No need to remove clock from mounting. Shows both the state of the tide and the time of day. Supplied with 3 brass screws for flange mounting. One of the smallest brass marine Time & Tide Clock available. Excellent quality. Please note the Time & Tide Clock should not be relied upon for navigational purposes. 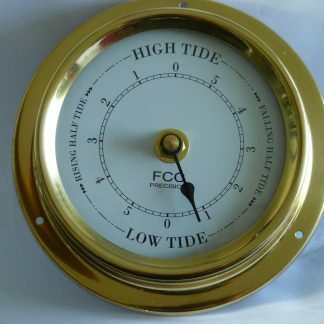 Brass marine Time & Tide clock. 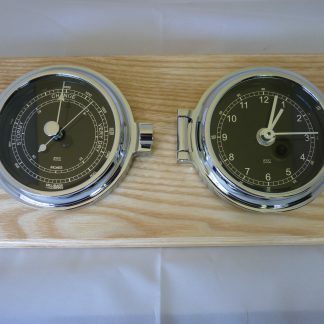 One of the smallest Time & Tide Clock available in this superior marine quality. Heavy cast brass case. Lacquered and varnished giving a highly polished appearance. Will not corrode in a marine environment. Fitted with rubber sealing ring stops moisture reaching mechanism. Slightly domed lens. Hinged door design allows simple access to alter times and fit battery. No need to remove clock from mounting. Shows both the state of the tide and the time of day. Supplied with 3 brass screws for flange mounting. 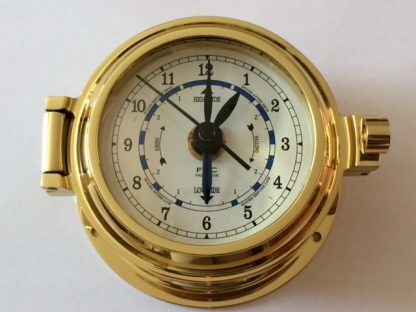 One of the smallest brass marine Time & Tide Clock available. Excellent quality. 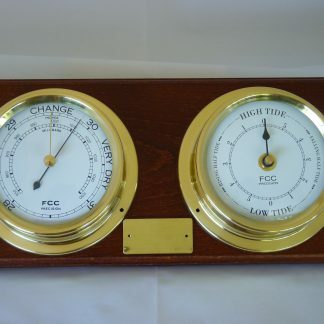 It must be stressed that other influencing factors such as storms, high or low surface pressure and direction can affect the actual tide times. The primary controller of the tides is the moon. The average duration between two transits of the moon around the earth is 24 hours 50 minutes and 30 seconds – this is referred to as the lunar or tidal day. It means the tidal day – to which the tide indicating hand is geared – is 50 minutes and 30 seconds longer than the solar day of 24 hours. 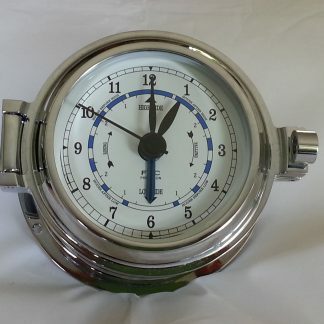 The Time & Tide Clock has four hands – the blue tidal hand runs 50 minutes late every 24 hours, thus indicating the average times of the tides at a given point. The regular hour, minute and second hand give you the regular time of the day.